It's been a while since I last used my little donut pan (maybe due to the lack of snow days) so I thought it was time to take it out for a spin. Baking a batch of donuts also served the purpose of helping me use up some of the buttermilk in my fridge. Whenever I buy buttermilk to make pancakes or a cake recipe, I'm on a mission to put as much of it to good use as possible. Well, the buttermilk went towards a very good mission here. 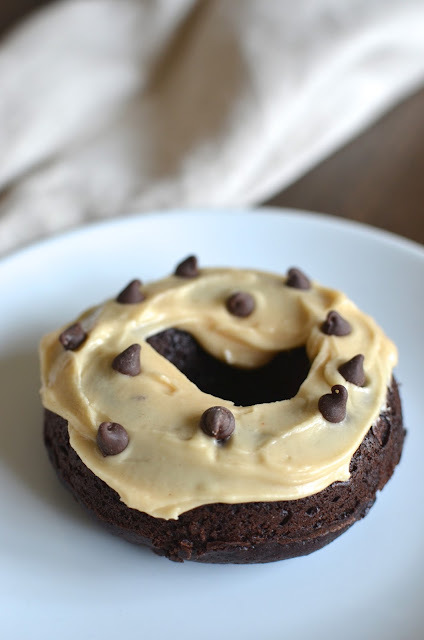 These baked chocolate chocolate-chip donuts are essentially a fun way to enjoy a few bites of chocolate cake! Handheld, portable, fun, and, most importantly, tasty - they made me glad I hadn't forgotten about my little donut pan. We already love chocolate chip donuts but hadn't tried chocolate chocolate-chip ones until now, and we may have found a new favorite. I used Christina's recipe from Dessert for Two and it turned out great; I love the lady - when she says the recipe makes 6 donuts, it really makes 6 donuts! And they're tasty little things - moist chocolate cake rings imbedded with mini chocolate chips. The donuts are good enough on their own that you almost don't need a glaze. Have fun with the glaze! Much as I could eat these donuts all on their own, you have to admit that the glaze on a donut (like icing on a cupcake) is half the fun and most people wouldn't want to go without it...so add a little extra flavor, and have fun! 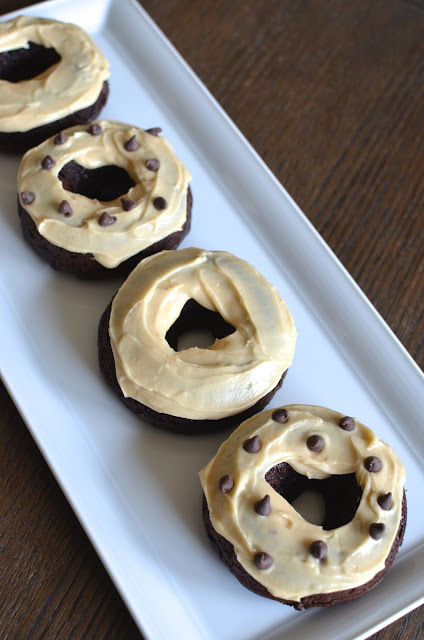 I loved Christina's original recipe of making mint chocolate chip donuts (and I knew my son would love it) but I had a strong hankering to make peanut butter glaze. Really, there are many varieties you can make by simply tweaking what you add to the powdered sugar for the glaze - it can be anything from a little maple syrup, to cocoa powder, fruit juice, or peanut butter. It's fun to customize! I have to fess up to the obvious: my peanut butter "glaze" was more of an icing. I have trouble gauging just the right consistency for my donut glazes so I thought I'd experiment with making it a little thicker and spreading the icing onto the donuts. Since they are called "frosted" donuts and we're basically looking at chocolate cake here, a thicker icing totally works, right? Besides the peanut butter glaze/icing, I also felt like making a coffee glaze for these donuts...so I did! I glazed 2 of the six donuts from my batch with a coffee glaze (pictured on the round plate below; you can tell it's a thinner glaze there). The coffee glazed donuts were quite popular at my house! And you know something? These donuts were so enjoyable, they disappeared so fast, and I was feeling so guilty about not making the mint chocolate chip donuts my son really wanted that I made a second batch in the same week! I'm glad I did! The mint chocolate chip donuts were much-appreciated by the little guy. It tasted a bit like you're having chocolate chip ice cream somehow! And so I've now learned...a dozen baked chocolate donuts is totally reasonable for a family of 3 to enjoy in a few days! The topic of pancakes comes up quite often here, and frankly, I'm at it again! There are a million variations to everything and I'm happy to try as much as humanly possible when it comes to food. That goes for pancakes and other things. The way I look at it, it's a good thing we eat so often! Let's start with these multigrain pancakes, a recipe that caught my eye in the latest issue of Cooking Light. 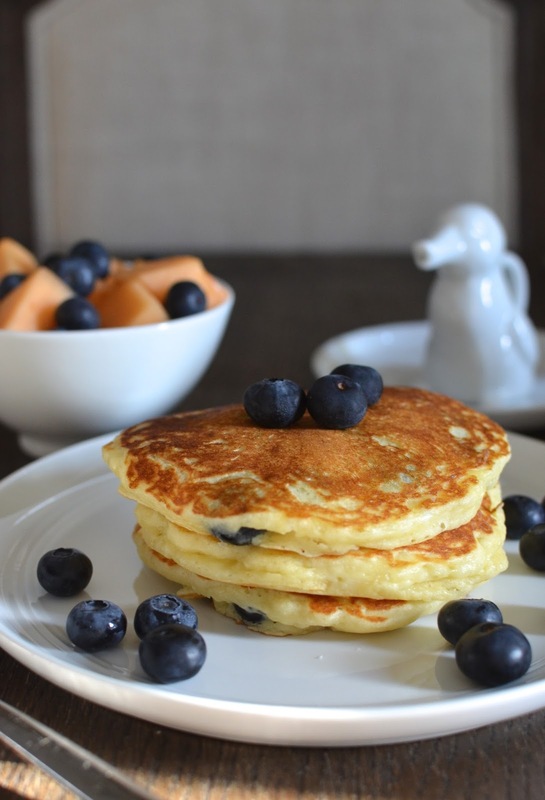 I'm reluctant to label things with titles like "healthy" or not (to my way of thinking, use common sense and enjoy everything in moderation) but it's more than fair to say these are a terrific, feel-good, option when it comes to pancakes. It's made with both old-fashioned oats as well as white whole wheat flour. The only unusual step in making these pancakes is first soaking old-fashioned rolled oats in buttermilk for about 10 minutes before proceeding with the recipe. This gives the oats a chance to soften and bloom slightly (very smart). The process is easy enough but I was a little skeptical about how these would turn out...would they actually taste good because not only are we using oats and whole wheat flour, there's no butter/oil in the batter and just a tablespoon of maple syrup to sweeten the batch. Well, my family and I were very pleasantly surprised. Somehow, these pancakes turned out creamy in the center (thanks to the soaking process, according to Cooking Light). Soft and fluffy, they were perfectly tasty. They might not be very rich in flavor on their own but paired with some fresh berries and/or bit of maple syrup, it is a very well-balanced pancake breakfast! You can also follow Cooking Light's cue of making a nut butter sauce to go with these (more on that later...) for a fantastic, healthy pairing. My son finished his 3 pancakes in no time and I was impressed with how much he liked them. These pancakes are both kid- and adult-approved! Now for this second segment of our pancake talk, I didn't try a new recipe per se...I tried a new technique. I recently read this article from Food52 about a genius tip on how to make fluffier buttermilk pancakes. I'll cut straight to the chase and tell you the "trick"...you know how you separate an egg and beat the egg white to fold into a pancake/waffle batter to make an extra fluffy result? Well, this tip suggests you put the whisk down and skip the whipping, and simply stir in the egg white at the end of making the batter. I don't know about you but I don't often take the extra step of whipping egg whites when I make pancakes because it's extra work and cleanup. This idea of stirring in the egg white without whipping sounded like a perfectly easy twist to try, so I did. Instead of using the recipe provided, I took a basic buttermilk pancake recipe I often use at home and simply followed the technique of separating the egg and reserving the white to stir into the batter at the very end. I had some blueberries on hand so I made blueberry buttermilk pancakes. I'm afraid I didn't go so far as to do a side-by-side comparison to show you (you can see a comparison at Food52) but I can tell you that we had a very fluffy batch of pancakes using this egg white technique. My husband definitely thought they were fluffier than usual. I don't know if it's positive thinking on my part but I also thought they were fluffier than the norm. It sure doesn't hurt to give it a try so the next time you make pancakes, consider making them with this little twist and see what you think (I'd love to know)! In conclusion, all these fantastic pancake recipes and cooking techniques give us more reasons to enjoy pancakes for breakfast. That's a very good thing! It's the day after Valentine's Day and I found myself in the kitchen making chocolate cookies. We seriously don't need more chocolates or treats after indulging (more than usual) the day before but I couldn't help myself. 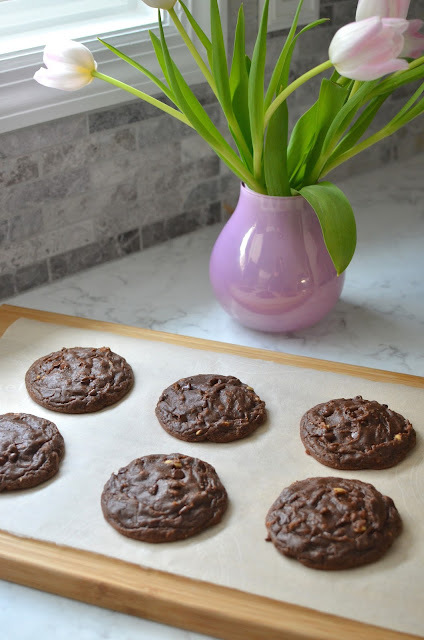 I got my hands on Christina Lane's latest book, Sweet & Simple, and these chocolate hazelnut cookies were just too easy and promising to resist. In my defense, it takes hardly any work and results in a very reasonable 6 cookies, which are sure to vanish quickly. I hope you had a sweet Valentine's Day! I loved seeing all the expressions of love and chocolate everywhere leading up to it. And speaking of things I love - I'm a big fan of small-batch baking and while I often just scale down recipes/divide them in half, I adore so many of Christina's recipes from her books and her blog, Dessert for Two! I've made many of her recipes - both sweet and savory, often on repeat. So I was eager to dig into her latest book, and it didn't disappoint. It's got all the straight-forward, simple recipes for small-batch baking that I've come to love. I decided to add some chopped toasted hazelnuts into the dough along with the chocolate chips (I used miniature ones). I always keep a jar of mixed nuts in the kitchen to snack on everyday so I just went and pilfered some of the hazelnuts for these cookies (I was in the mood for some extra texture and I think nuts help balance the sweetness). Instead of all-purpose flour, I used white whole wheat flour (these cookies are so moist, they can take it) and rather than sprinkling the baked cookies with sea salt on top, I added a pinch into the dough. In a flash - I had 6 fudgy, moist, chocolate-hazelnut cookies on my counter. They are chewy and sticky (my husband likened it to marzipan), and on the sweet side so the hazelnuts were a welcome addition of texture and flavor as a bit of a contrast. Because these cookies are so fudgy in the center (thanks to the chocolate-hazelnut spread), you might want to be a little patient and allow the cookies to cool and firm up fully before removing them from the baking sheet. My husband brought home some sweet strawberries for me on Valentine's night (incidentally, I took a few and dipped them in dark chocolate; they were so good and easy to do, making me wonder why I'd never done it before!). 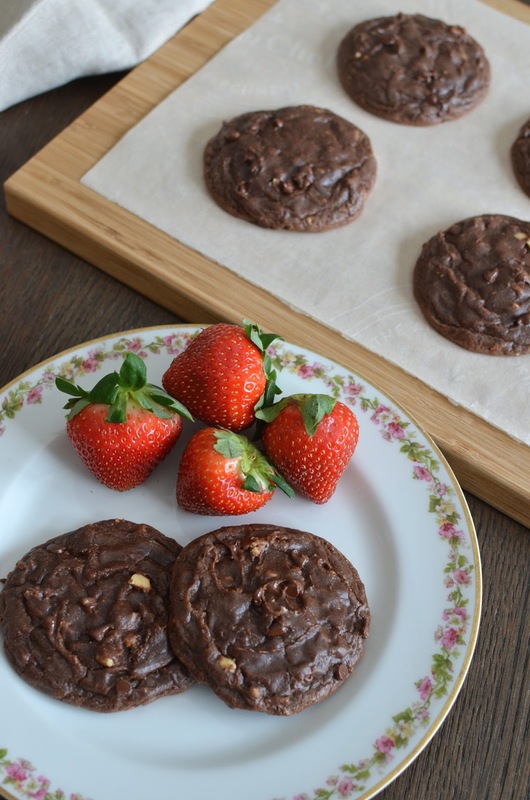 And so I thought a few strawberries with one or two of these cookies would make a well-balanced snack/dessert. I hope you agree. This breakfast comes to you fresh from yesterday's snow day. We finally had a snow day! I didn't think I'd say or think this but I missed having a snow day this winter and was actually hoping for one - emphasis on "one". Well, my wish came true - snow fell and we were all home, from school, from work, and got a chance to enjoy a little hush and quiet, and to huddle around in the house on a weekday (before it was time to get busy and start shoveling). With a snow day, it's important to have plenty of food! It's also a great time to try a new recipe. For me, I jumped at the chance to make these almond paste waffles! If there are a few food items I really love, it's got to include things like chocolate, eggs, almond paste, nuts in general, and sweet potatoes. Almond paste is right up there. We love it in baked goods and I've used it in all sorts of ways but not in waffles so when I saw almond paste waffles on Food52, I couldn't wait to try it! These waffles turned out crisp on the outside, soft on the inside, with a bit of chewiness to its texture, and nice almond flavor. It's basically how almond paste waffles should taste, I think. Almond paste is incorporated into the waffle batter by stirring/dissolving small pieces of it into some warmed milk and butter. I used whole milk instead of the buttermilk listed in the recipe, and I would strongly suggest the swap out because buttermilk has the tendency to curdle when heated. I didn't have buttermilk on hand so I made a proxy using milk and white vinegar; the homemade buttermilk quickly curdled as I heated it and I had to restart using milk instead. You might have less of an issue using actual buttermilk rather than my substitute but I'd bypass the risk and go with milk. To amp up the almond flavor, I added a touch of almond extract. 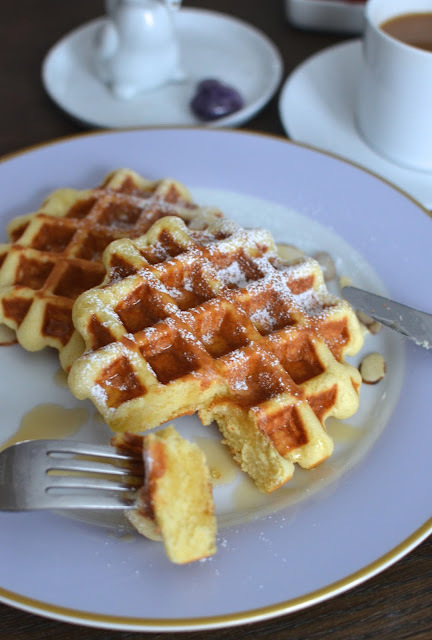 The batter is on the thick side and when cooked, you end up with familiar waffles that have a distinct almond flavor and a little chewiness that we really like. Ironically, the waffles tasted a lot like this almond bread I adore and which I happened to have made a loaf of just 2 days earlier! It's been an almond breakfast kind of week! As you know, Valentine's Day is coming up. How about having an early celebration this weekend with a nice breakfast on Sunday? If you have an almond lover among you, these almond paste waffles might be just the right treat! Otherwise, you can always make a batch of chocolate chocolate-chip waffles instead! A batch of soft chocolate cookies, frosted with creamy chocolate frosting, and decorated with a few Valentine's Day sprinkles is an easy way to say "Happy Valentine's Day". I think it's particularly cute for kids so I made them with my son and his cousins in mind. I also had my husband in mind; he's a big kid at heart, with a bigger sweet tooth than most children, so he got a fair share of these. You might know I'm always looking for an excuse to try a different chocolate recipe of some kind! This one came my way via Mel's Kitchen Cafe. When I saw "super soft" chocolate cookies, with chocolate frosting, I thought my family would enjoy them and I wanted to give it a try. Apparently, these cookies are a homemade rendition of "Swig" cookies. I have no personal knowledge but it seems Swig is a sweet shop in Utah and their signature Swig soft sugar cookies have a big following. I just saw super-soft chocolate sugar cookies and thought my husband, who prefers thick, soft cookies above all else in terms of texture, would really dig them. And true to the description, as long as you make sure not to over-bake them, you end up with a chocolate sugar cookie that has a wonderfully unique soft texture. The cookies might lean on the sweet side but there's also plenty of deep chocolate flavor to balance it out. My fellas and I enjoyed them very much. Though I've never heard of or had a Swig cookie before, there is a familiar flavor to these cookies that my husband and I had to smile at. You can leave your frosted chocolate cookies unadorned (the way my husband likes it) or I think it's great how you can essentially dress them up/customize them for any holiday with some sprinkles! So make these cookies for no particular reason or for a holiday like Valentine's Day, Easter, or Halloween by simply mixing up the decorations you place on top. How fun and versatile is that! I packed a few of the cookie individually in small clear cellophane bags, sealed with a heart-shaped sticker, to give to my nephews and niece as a little early Valentine's Day treat. It's a fun little gesture - I think it's always nice to spread the love with cookies. I also think if there's any group of people who deserve love and sweetness on Valentine's Day (and any other day), it's got to be kids!